April brought us a shower of Munchkin and GURPS games! A fresh take on classic Munchkin, a brand-new booster, and a couple of previously hard-to-find favorites all hit shelves (or sites) this month for your gaming pleasure. Edwin Huang, artist of Skullkickers and Street Fighter comics drew, Munchkin Skullkickers for us, and now he's illustrated a totally awesome version of Munchkin for our Guest Artist Edition line! His art has a sense of motion and dynamism that'll make those Munchkin cards seem that much cooler! 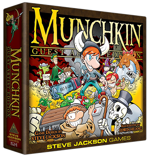 This Guest Artist Edition includes completely re-illustrated game cards, a gameboard featuring Edwin Huang's Munchkin art, and male and female standies for each player. You can find out more about Edwin and what comes in the box from our Daily Illuminator articles! It's chaos! It's madness! It's . 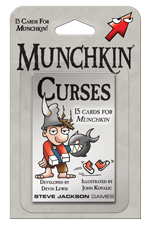 . . Munchkin Curses! That's why this booster contains 12 new Curses, two new monsters, and one Curse Reverse to shuffle into your Munchkin game! 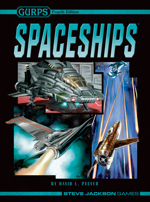 The ship design and operation rules in GURPS Spaceships are more abstract than those found in GURPS Vehicles or GURPS Traveller: Interstellar Wars . . . but they're much faster, with a minimum of math and a maximum of colorful options. It takes only minutes to build even the largest spaceship . . . and wrapped around the design system are basic space travel and combat systems to get you into space right away. This long out-of-print book is available again via CreateSpace print-on-demand service! Get it on CreateSpace or Amazon! A dead body, no witnesses, and a room full of suspects with perfect alibis – can you find the killer and bring him to justice? Learn the secrets of mystery fiction and what will, and will not, work in an RPG mystery. Learn how to be a better investigator. Learn the problems you are likely to encounter in a low-tech, magic, super-tech, or horror mystery. 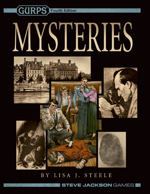 GURPS Mysteries is designed both for the GM who wants to create and run mystery adventures and for players who want to create and portray more effective investigators in any setting.